Years before joining the IMF as Ethan Hunt in the Mission: Impossible franchise, Tom Cruise mostly starred in dramas, with most of them becoming iconic classics. 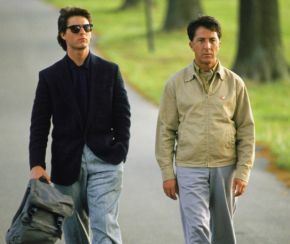 In this week’s Rewind Review, we travel back to 1988 and take a look at one of his most memorable films, the Oscar winning Rain Man. Rain Man tells the story of Charlie Babbitt, a hot-headed car dealer, who learns that his father has died. When he returns home, he learns he has an older autistic brother called Raymond and that his father is leaving his fortune to the mental institution Raymond lives at. Motivated by the money, Charlie takes Raymond on a cross-country trip that changes both of their lives. Tom Cruise stars as Charlie Babbitt, who starts out uptight and easily irritated by the needs of his brother. Over the course of the movie, his attitude changes and its here that Cruise is at his best. The performance is fantastic and believable, providing some touching moments and some of the best parts of the film. Playing his brother Raymond is Dustin Hoffman (The Graduate), who manages to craft a realistic portrayal and look at a man who has autism. He is nothing short of perfect for the role. He’s disconnected from the other around him, with no eye contact and genuinely seems to be in a world of his own. Valeria Golino (Hot Shots) stars as Charlie’s girlfriend and co-worker Susanna, who only has a presence during the first act of the movie. She doesn’t have a lot to do, but the story doesn’t focus on her character. The performance is good and her part in the film works well with the plot, but she could do with some more depth. The story is about the two main characters travelling from Cincinnati to Los Angeles the long way. For eighty percent of the film, it is completely focused on Charlie and Raymond, with the main plot centred on the characters experiences. It also incorporates the usual distractions and obstacles as the travel across the country, but from internal sources. The movie aims to help educate, or at least address, autism. For the most part, the film focuses on Charlie Babbitt showing how he copes with his brother and how he reacts and copes with him, but it does manage to find ways of showing the audience Raymond’s world, with close-ups of what he sees, increases in sound levels, such as alarms and running water, and some scenes that show him in everyday situations. It may be a drama, but that doesn’t mean it’s completely serious, with some very funny sequences, including Raymond’s ability to memorise part of a phone book and a slight inability to understand jokes. It’s a good method of addressing a subject, rather than playing up the downside as many films tend to do these days. It also shows how believable the relationship is between the two leads. The comedic aspects allow us to connect with the characters and truly invest in their developing relationship. There’s a good balance between the emotional moments and the comedic which makes the film more watchable. The movie is directed by Barry Levinson (Good Morning, Vietnam) and written by Barry Morrow, who have created a brilliant character driven story. It would have been easy to keep the characters in one place throughout the story, but they opt to let the characters trek across the county in a car, after Raymond refuses to get on a plane. The journey is what allows them to bond. The music was composed by the brilliant Hans Zimmer (The Dark Knight), who creates a score that is most definitely from the 80’s, but subtle enough that it fits what’s happening on screen. It isn’t as dramatic or thunderous as his work on Man of Steel (2013) or Rush (2013), but it works well for the film. Overall, this is an incredible and heart-warming movie that tackles a subject rarely tackled on the big screen. The actors are fantastic and give some of their best performances to date. The story is nothing short of timeless and a must-see. Purple Revolver rating: 5/5. Oscar winning for a reason.